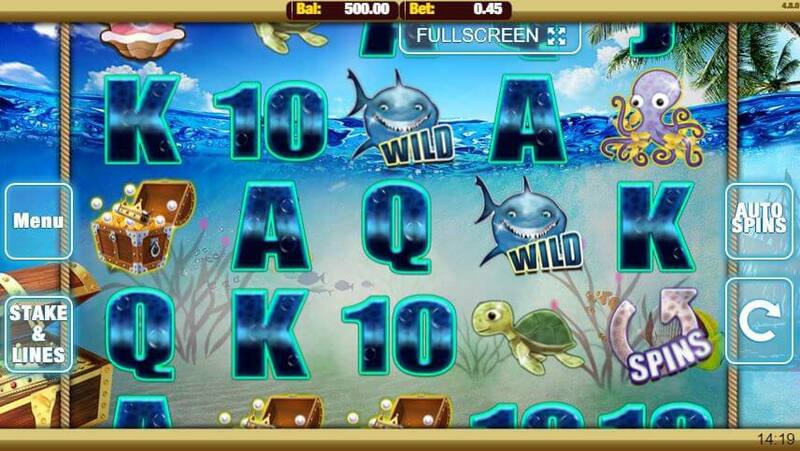 It’s quite hard to create realistic graphics that display a view both in and out of water, but developer Nektan has managed it for its Pearls Fortune slot title. The rope-framed transparent reels hang against a beautiful blue seascape, with a few puffy clouds in the bright blue sky and the waving palms of a nearby island visible at the top of the screen, while the lower two-thirds shows the view underwater. While the backdrop is designed, like most Nektan backdrops, to look amazing, the icons used in the game are rendered with the same attention to detail, but a bit more humour. The five Poker symbols used as Pearls Fortune low-scoring icons, 10 to A, are drawn in chunky fonts filled with water and bubbles. Five As, the biggest possible win with these symbols, wins 150X the line bet. The designers have gone even more cartoonish with the higher-value symbols. Even the Wild, which can replace any other icon except the Scatter in winning combos, is rendered with a big friendly grin, even though he’s a shark. The high-value icons, in ascending order of prize value, are a turtle, a sunken treasure chest, an octopus, a giant clam revealing a huge pearl, and the Pearls Fortune slots logo. Five logos wins a top prize of 2,500X the line bet, which is substantially bigger than the best win in several other Nektan games. In addition, the treasure chest, octopus, clam and logo all begin paying wins for two of a kind, matched in sequence from Reel 1 on the same payline. All other symbols require three of a kind or better to win. This is filled with fish, a sunken ship and treasure chest, and flower-like corals. Visually, it’s eye-catching, which is one of the secrets of Nektan’s success as a developer. They design slot games primarily for mobile play, and use a tried-and-tested template to give a uniform experience on mobile touchscreens of all types. To offset this uniformity, they keep their titles fresh by putting extra effort into the design of backdrops and playing symbols. Although Pearls Fortune plays just as seamlessly on fixed computers, using a mouse or track pad, the slot has been designed for effortless play on both smart phones and tablets. So the controls are not clustered at the bottom of the screen, as they are with most digital slots games. Instead, they are housed in two pairs of buttons, set on either side of the screen within easy reach of the thumbs, when playing on a smart phone. The right-hand buttons trigger spins and auto-spins, while the left-hand buttons click players through to other menus, so they can set their paylines and stakes, access information on the best real money pokies game, or adjust other settings. A circular arrow labelled Spins is the Pearls Fortune slot Scatter icon, and the player needs three or more to trigger a bonus round of free spins. Pearls Fortune features an unusually low number of paylines for a Nektan slot: only 9. Players can bet a minimum of 0.01 and a maximum of 1.00, in the selected currency, on each payline, so the maximum bet per spin is 9.00. However, given that the top prizes are about two-and-a-half times bigger, at least, than those in most other Nektan slot titles, there is no significant difference in the rewards players can expect when playing this title.